CINCINNATI, OH (January 18, 2017) – The Cincinnati Zoo & Botanical Garden’s first baby of 2017 is a guereza colobus, a type of monkey once thought to be abnormal because it has no thumb, or only a stub where the digit would usually be. Born last week to first-time-mom Adanna and dad Tiberius, the still-unnamed little one is strong, alert and nursing. Gender is not yet known. 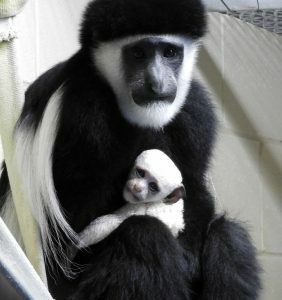 Guereza colobus are born snowy white with pink faces and blue eyes, which makes it easy for the mothers and families to see them in their native dense African rainforest canopies. However, they quickly turn to the full adult coloration by around six months. All colobus females look after each other’s kids as they play around in the thick treetops. Colobus monkeys spend the majority of their time in trees. They are entirely vegetarian and equipped with a three-chambered stomach to help digest large amounts of leaves. The biggest threat to the colobus is habitat loss. When forests are cut down to make room for agriculture, settlements, and roads, the colobus monkey loses its home. Mom and baby will be bonding behind the scenes during the cold months but will be viewable in their outdoor space later this year. « Ultrasound Confirms Hippo Pregnancy!